At the turn of the 21st century, the public/private regulatory partnership established in 1934 was showing its age. Despite getting something of a facelift in 1975 when the Securities Acts Amendments substantially enhanced the SEC's oversight over the SROs and sharply limited SRO authority, the underlying structure endured. 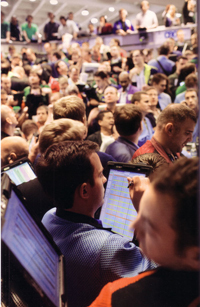 It had once been feasible for every exchange to police its own trading floor, but new creatures—more computer programs than exchanges—were overtaking the market. It had once been reasonable to think that the extra legal obligations of private organizations could hold the baser instincts of most members in check, but exchanges were becoming businesses and those bonds were breaking. The old structure had been erected in the bright light of public hearings, debate and legislation. It was dismantled and replaced more quietly as the financial industry, encouraged by the SEC, revolutionized the public/private self-regulatory regime.